The Prime Minister, Shri Narendra Modi and the Prime Minister of United Kingdom (UK), Mr. David Cameroon, at the Drum (Treasury Quadrangle), in London on November 12, 2015. Grand reception to Prime Minister as he arrives in London on three day visit ; PM holds bilateral meeting with British PM David Cameron , PM will also address the British Parliament later in the day. Prime Minister Narendra Modi was accorded ceremonial Guard of Honour at London’s Charlse Street. British PrimeMinister David Cameron was present on the occasion .He welcomed thePrime Minister Narendra Modi at the ceremonial reception. Earlier, the Prime Minister was accorded a warm welcome at the Heathrow Airport. He was received by Minister of State at the Foreign and Commonwealth Office Hugo Swire and Priti Patel, Member of UK Parliament in Indian origin. Prime Minister was welcomed by a huge enthusiastic crowd outside Hotel James Court. The visit aims to strengthen economic relationship and enhance ties in varied areas like defence, security and clean energy. Stepping up cooperation with United Kingdom in combating terrorism and extremism would also be high on the agenda of the prime minister. 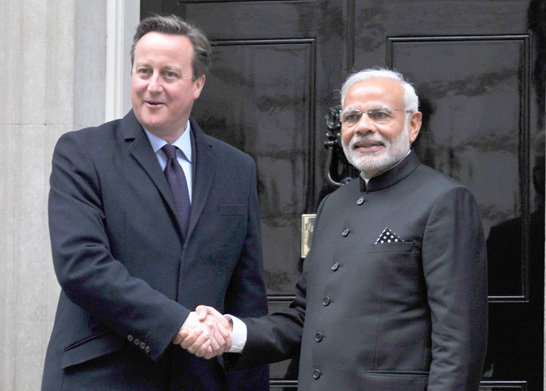 Later today, Prime Minister Modi would also be addressing the British Parliament and meet Prime Minister David Camron. Prime Minister is scheduled to have lunch with Queen Elizabeth II at the Buckingham Palace. The Prime Minister would also address a reception at the Wembley stadium in London, which is expected to be attended by around 60,000 people. Prime Minister Modi would also interact with CEOs at a roundtable in London. He would later visit Tata-owned Jaguar Land Rover factory at Solihull.